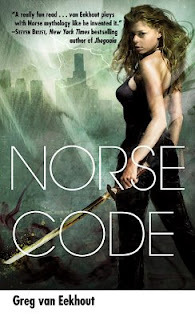 I just picked up Norse Code by Greg van Eekhout and C.C. Finlay's A Spell for the Revoltion. I also grab a used copy Pete Jordan's Dishwasher: One Man's Quest to Wash Dishes in All Fifty States because I love a good travel narrative and my goal is to one day visit all 50 states. I'm at a little more than 40 states right now. Half of those states were taken care of with a two month long road trip and a month long trip around on the train to as many major cities as I could fit in. Look for reviews of the first 2 in the next couple of weeks. Dishwasher will probably wait until my summer vacation. These will probably be the last of the books I buy (except The Angel's Game) for a while since I will be attending Book Expo America where I expect to get quite a few advance reading copies.